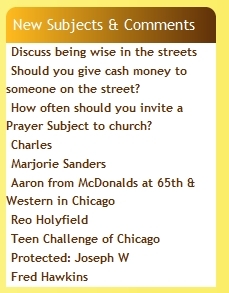 click on the Prayer Warrior’s Discussions link. new discussion topic or to report salvations or a very dynamic church meeting. moves to the top of the list. 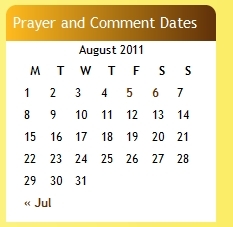 The Prayer and Comment Dates module is a calendar that designates the dates when a new entry was originally made or created. The dates will be bold and reddish in color on the dates when an entry was first made. If you click on that date it will bring up all the entries originated & posted on that date. It could be the date new discussion topics were originally made or the date of the addition of new Prayer Subjects. Wide News Announcement page. Check this page often for important announcements. different features f the Prayer Warrior site. creation of the Topic or Prayer Subject; the listing here is when comments are made on entries ALREADY CREATED. with the Spirit and urgency of this statement. These are Frequently Asked Questions and answers. be used in our private devotional time if desired.